Cataracts are opacities or white areas in the lens which is located inside the eye and functions to focus light on the retina (back of the eye) for visual processing. Cataracts in dogs have many causes with the most common type of cataract being heritable, or breed related. Another common cause of cataracts in dogs is systemic diabetes. In fact, up to 80% of dogs will develop diabetic cataracts within sixteen months of a diagnosis of diabetes. Whether a patient develops cataracts is not dependent on how well the diabetes is regulated. Cataracts may remain stable for long periods of time or may progress over time, with a variable rate of progression. Cataracts cause inflammation inside the eye and may cause other serious diseases such as glaucoma, lens displacement or retinal detachments. The biggest concern, however, with cataracts is that they often cause vision loss or blindness. The diagnosis of cataracts may not be straightforward because other conditions of the eye can cause “cloudiness” or white discolorations. A full ophthalmic examination with a board-certified veterinary ophthalmologist is recommended to assess cataracts. If cataracts are diagnosed, they may be treated with phacoemulsification, otherwise known as “cataract surgery.” Surgery is typically pursued if there is significant vision loss causing changes to a patient’s lifestyle or behavior. This may vary depending on the dog’s level of activity and daily routine. Often, vision loss may not be recognized until the pet is taken to a different environment with which he/she is not familiar. Common signs of vision loss include bumping into objects, falling on or missing stairs, increased sleeping due to reluctance to move around, hesitancy to move in unfamiliar environments or increased contact with the owner (e.g. following the owner around more than usual). These signs may appear gradually or may occur quite suddenly depending on the progression of the cataracts. Cataract surgery involves removal of the abnormal lens and replacement with a new, artificial lens. This is done through a very small incision on the side of the eye. The new lens is foldable and able to be placed through this small incision. The small incision decreases overall anesthesia time and complications after surgery. The procedure in dogs is the same surgery that is performed in humans for cataract surgery, even though the canine or dog lens is approximately four times the size of the human lens. The success rate of cataract surgery in dogs is 90-95 percent. While no surgical procedure carries a 100 percent success rate, the success rate of this surgery is very high, especially if done by a skilled board-certified ophthalmologist. The surgery is able to restore normal vision for a blind or significantly visually impaired pet, often completely changing their behavior and activity level. Many people state that cataract surgery “gave their dog back their life,” enabling them to play with toys, run outside and interact with other dogs again. The change in a patient’s demeanor after cataract surgery is often dramatic and one of the best events to witness for a veterinary ophthalmologist. 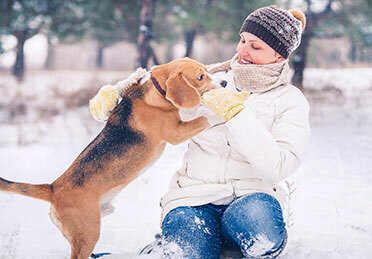 This surgery is offered by board certified ophthalmologists at MedVet. A cross section of the eye is depicted with the black arrow indicating the lens. This structure is normally clear, but may become milky or whitish with cataract formation. A photograph of a patient with cataracts is depicted. The lens is whitish-gray and this patient was blind before surgery. A photograph of a patient after cataract surgery is depicted. The new, artificial lens can be seen. This patient had normal vision after surgery.